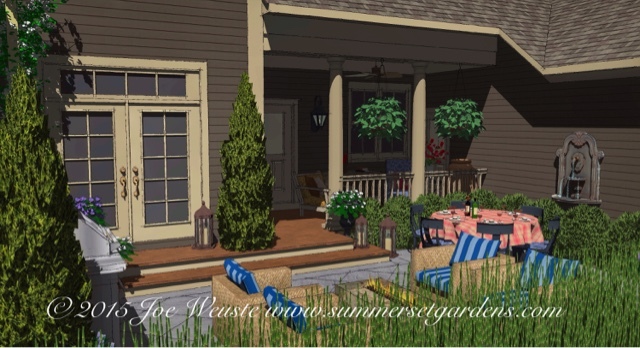 A small outdoor room design for a home located in Warwick Grove, NY. I created a wood porch with steps that wrap and tie in two sets of doors. I added a lantern, ceiling fan, hanging baskets, planters and lounge furniture to the porch area. Two cut outs, water proofed planters with a root barrier in the step landing allow me to plant a conifer and climbing flowering vine. The patio is just large enough to accomadate a dining table that seats six, a gas grill, and a gas fire pit that seats four. There is still room easily walk from area to area. Landscape architecture, Landscape design, Garden design and installation services in the NY and NJ areas.